The natural world is an amazing place, and summer in particular tends to draw us out to explore what nature has to offer. With the many benefits that being outside offers children, and my own love for the great outdoors, I try to use outdoor activities to instill in children a love for our environment that will cultivate a relationship with the Earth. I’ve seen a lot of amazing lists of things to do outside with kids, but I keep noticing how artificial many of these activities are. I don’t say that in a negative way – there are a lot of incredible engaging outdoor activities to try in summer. However, I wanted to offer you something a little more centered on the idea of specifically enjoying the natural world, as it is, without simply setting up an early learning activity outside. I hope that in putting together this list and sharing it with you, we will all be more motivated to get outside and try something with our children that will inspire an enjoyment of, and respect and responsibility for, our natural outdoor environment. Being that summer is in full swing here, you’ll have to give credit to Boiron for pulling me inside and onto the laptop to share these ideas with you. I’m thrilled to be acting as a #BoironFamily ambassador for this brand of homeopathic medicines that’s been awarded #1 Pharmacist Recommended Over The Counter Brand. I’ve been a very happy customer of this brand for years, and am excited to share with you their different options for relief from your summer activities woes. With the good comes the bad, and it’s important to be prepared for all those undesirables that may pop up in your outdoor adventures. Boiron makes homeopathic medicine to ease the unwanted ailments that sometimes come with exploring outdoors. Their line of medicines that are perfect for packing in your summer outdoor activities kit are Arnicare, Dapis Gel, Coccoline, and Sabalia. What, you may be asking, are those? 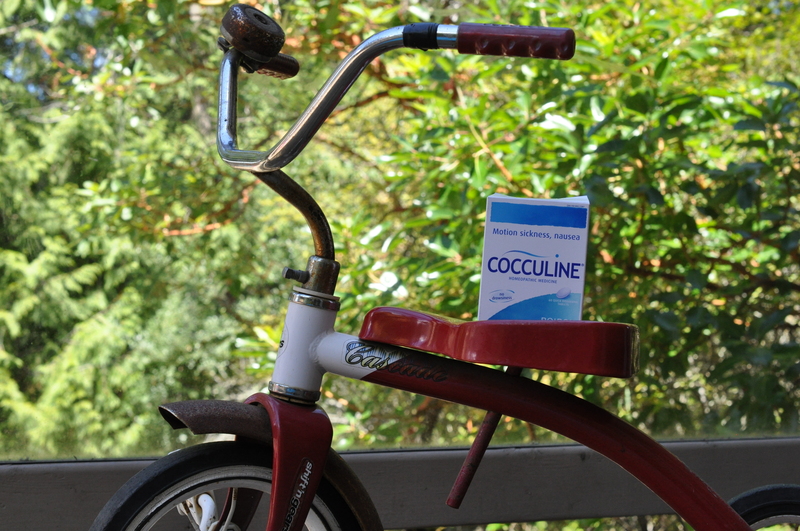 If you get motion sickness symptoms like nausea, vomiting, dizziness and cold sweats, adults and kids 2 years of age and up can take Cocculine, a non-drowsy, quick-dissolving tablets you just pop in your mouth. I tried them with Z when she went through a bout of nausea and puking, and she easily accepted them. They seemed to give her comfort in the simple act of taking them, and she did seem to perk up for a while after each dose. To relieve itching and hives, and promote healing of insect bites, you can try Dapis Gel. We’ve been lucky to avoid bites and brushes with hive-causing foliage, so I haven’t had the pleasure of being able to use it properly yet, but I’m keeping it on hand for when I do. If you get seasonal allergies to all that beautiful nature, like I do in the early spring, this bit of homeopathy is just for you. Sabalia relieves symptoms of seasonal and environmental allergens, such as sneezing, runny nose, itchy, watery eyes, and scratchy throat. And now, let’s talk about those outdoor activities to share nature with your little ones. Camping is a classic way for kids to fall in love with being outside. Make sure you’re prepared to enjoy your time together in the great outdoors, so that everyone has a positive experience. Even if things go awry (Who forgot the tent poles? Will it ever stop raining? ), try to make light of the situation and turn it into a funny memory looking back. If you’re planning on camping with a 1- or 2-year-old, check out these tips for camping with a toddler to help set you up for success. Once your child is capable of safely handling a camera (or you find a kid-friendly camera), you can offer them the chance to see the world in a whole new lens. Make a journey out specifically with the intention of capturing images of whatever sparks your interest. There are so many spectacular views and trails to explore, no matter where I’ve found myself. Search for some hikes in your area, slap on some sturdy shoes, grab some water, and head out to explore something naturally amazing. Try building a simple stick shelter or an elaborate tree house, depending on your time, ability, materials, and the ages of your kids. Encourage problem solving and construction skills while creating a space together. Geocaching is one of the most amazing outdoor activities to encourage children to get outside. If you’ve heard of this new Pokemon Go thing (which I’ve got nothing against), it’s a lot like that. You search for hidden containers (many of which hold little treasures others have left that can be traded for new items), based off of geographic coordinates. You can use a compass or gps tool, or even a simple app on your phone. They’re hidden all over the world (you can add your own, too), and they often are found at spectacular natural landmarks and viewpoints. Here’s a post on geocaching to tell you more and get you started if you’d like to learn more. Scavenger hunts offer a fun way to get kids paying attention to what’s around them. There are printouts for nature scavenger hunts you can find, or you can quickly make up your own for kids of any age using these nature scavenger hunt instructions. You’ll be looking for things out in nature, just like with the scavenger hunt, but this time you’ll be finding things to keep. Collecting interesting things from the forest to use for loose parts play can be another kind of a treasure hunt that leaves you with a set of natural materials. Make temporary art, save on materials and production for toys and supplies, expand imagination, offer a blank slate for creativity, and work with concepts that matter to the child through pretend play. So much much awesomeness. You can check out more about loose parts theory here. The memory of watching my toddler paddle around on a paddle board with her dad makes me smile. It’s an activity that can be adjusted for level of fitness and effort, so even I could do it. I loved watching the sunset over the islands from Vesuvius Bay my first time out there. Make sure to check out Gigi’s Paddleboard Rentals if you’re ever on Salt Spring Island for that awesome experience. I will certainly not be the primary cycling role model in my little one’s life (my biking life has been sparse since childhood). Little Z’s old man, however, has a lot of experience biking on trails and is eager to get her out there. She’s been happily booting around on her little runner bike, so hopefully she’ll feel more confident peddling around than I do. Surfing, boogie boarding, body surfing, tubing. There are a lot of different water sports with the same theory: glide on over some waves. If you can borrow, rent, buy, or otherwise gain access to a boat – sail, speed, anything – you can see some beautiful scenery from the open expanse of the water. If you have a fishing license and some equipment, you could also catch some fish, crabs, prawns and whatever else is out there where you are. While there are many outdoor activities to try in and outside of this list that you can do while enjoying nature with kids, the important thing is just getting out there. The rest comes pretty naturally. Like what you read? Sign up here for my short weekly “What’s New On The Big To-Do List” email. I’d also love to connect with you on Facebook, Twitter, Instagram and Pinterest. Disclosure: I’ve said it before and I’ll say it again – I’m thrilled to be an ambassador for Boiron. Regardless of their sponsorship, all of the above is my own true and personal opinion and experiences. You can check out my first post as ambassador on Green-Living Baby Gifts here, and my full disclosure policy here.